According to the American Society of Anesthesiologists, a survey showed that six in ten Americans don''t know that anesthesiologists are medical doctors. It declined to reveal what the survey participants thought anesthesiologists are trained in. Consequently, the ASA will from now on use the term "physician anesthesiologists" every time they want to say anesthesiologists. You can see the change in terminology in all ASA publications and news releases. To me, this seems a little bit petty. Are we so insecure in our medical standing that we have to emphasize "physician" when we refer to our own profession? I suppose it is a little pathetic that this is even an issue. Nobody doubts that their surgeons or cardiologists are physicians. Heck even radiologists and dermatologists are assumed to be physicians without needing any verbal reinforcement. Have anesthesiologists fallen so far in the public conscience and esteem that we have to be in their face about our medical training? In addition, "physician anesthesiologist" doesn't exactly roll off the tongue. Some people have shorthanded anesthesiologists to MDA. However, a few anesthesiologists found this term insulting as it assumes that the "A" can be anything besides a doctor. Also some of our colleagues are not MD's but instead graduated from osteopathic schools. I don't think they would appreciate being lumped in with MDA's, or even worse, be referred to as DOA's. So the public relations war with CRNA's goes on. It's like the battle between iPhones and Android phones. Both function nearly identically with very little differentiation or proven advantages. To win the hearts and minds of patients, elaborate advertising campaigns need to be waged. Money that should be used for improving patient safety instead is being spent on wining and dining politicians and expensive advertisements. I just wished they had spent some of that money to come up with a catchier term than "physician anesthesiologist". How about the "dream team"? "Hello Mrs. Jones, I am your dream team for your surgery today." Doesn't that sound better? You think you have a difficult patient in preop? 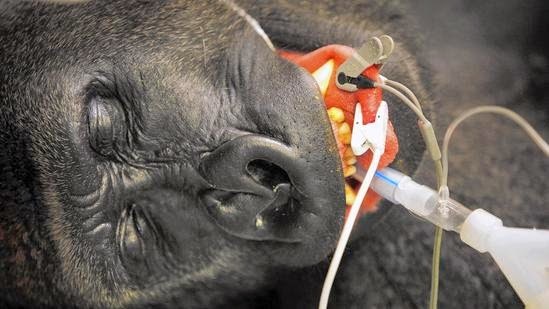 Check out this article in the LA Times about treating an uncooperative gorilla at the LA Zoo. Jabari, a 16 year old, 360 pound gorilla at the zoo contracted valley fever, an infection of the lungs by coccidiomycosis. Even though he was severely ill and lost twenty percent of his body weight, he refused to take any oral medications, no matter how craftily his handlers hid the drugs in his food. They finally realized that Jabari can only be treated successfully with IV antifungal agents. Since gorillas don't sit cooperatively for IV treatments, the only alternative was to sedate him under general anesthesia 25 times in 2 months. Finally he started recovering from his infection and now only needs to take an oral drug that is mixed with his grape juice at a cost of $17,000 per month. The tricky part, of course, is how do you wake up a sleeping gorilla if you're the veterinarian in charge of sedation. Very carefully, of course. There's a nice little blurb at the end that describes how everybody except the doctor is ushered quickly out of the exam room at the end of the procedure. The veterinarian stays and monitors the patient until there is the faintest signs of emergence such as finger twitching. The endotracheal tube is then quickly pulled and she too hurries out before the gorilla regains full consciousness. Somehow makes my days sound unexciting and mundane by comparison. Why Isn't Healthcare Anybody's Pet Project? The California Legislature are busying congratulating themselves this week on passing a budget on time. Apparently the ability to perform one's job in a timely manner deserves high praise up there in Sacramento. The $156 billion budget was approved relatively painlessly because of record amounts of revenue being collected by the state. This is due to a combination of tax increases passed on the top 1% two years ago, an expanding economy, and a booming stock market centered around white hot Silicon Valley. There is a little bit of something to fulfill every Democratic representative's campaign promise. Free preschool will be available for all low income families in the state. Public education will see a ten percent increase in their budgets. Felons convicted of drug crimes can now receive food stamps and welfare payments. And the biggest pet project that was saved by this budget? That would be Gov. Jerry Brown's white elephant otherwise known as the high speed rail project or bullet train to nowhere. This train has been in the planning stages for years after it was sold to voters in 2008 as a cost effective means of transportation between San Francisco and Los Angeles and a source of thousands of construction jobs. The initial estimate placed the price tag at $33 billion. Since then the cost has ballooned to anywhere from $68 billion to $99 billion without one piece of dirt being turned over for construction. The train's initial route has also been downsized. If and when it begins, the bullet train will run between the Central Valley towns of Fresno and Bakersfield, not exactly places millions of people are clamoring to reach. Though now opposed by a majority of Californians, the state legislators shuffled some dubious new found money from the state's cap and trade pollution program to fund hundreds of millions of dollars towards furthering the program's existence. Gov. Brown is expected to sign the budget expeditiously. Who are the biggest losers in this budget? The state's healthcare system of course. California cut MediCal reimbursements to doctors by ten percent a few years ago during the depths of the economic and budget crisis. Since then it has refused to bring it back to its previous level, which isn't even close to accounting for medical inflation. In the meantime, the state has opened its doors for over one million more people to enroll in the state health program thanks to Obamacare. But does the governor care if all these newly insured patients can't find any doctors willing to see them at the rates paid by the state, which is only about half Medicare's rates and one of the lowest in the nation? Apparently not since he is thrilled with the new budget. Sick patients are the doctors' and hospitals' problems, not his. In the end, healthcare for the people becomes a tool to help politicians get reelected. Though opening up Medicare to the masses makes great headlines, less is mentioned about how access has been restricted due to poor reimbursements or narrowed physician networks. Let's not even mention that California's new prosperity is owed in part on TEMPORARY tax increases that are set to expire in five years. The legislature is too busy making ongoing fiscal commitments to every liberal lobby to worry about how this windfall will need to be wound down soon. There are no champions in government for true universal healthcare, only ideas to help incumbents get reelected. And doctors are bearing the brunt of this fiasco. Just came back from a little R and R in Las Vegas. Despite what the surgeons might think, even anesthesiologists need to rest now and then. One of the mandatory activities one must do while in Vegas, besides the usual suspects, is the Vegas buffet. 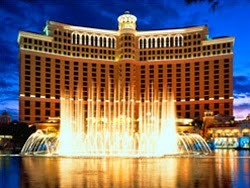 In my book, one of the top hotel buffets in the city is at the Bellagio. We go there almost every time we're in town. The anticipation is almost breathless as we wait in line to get our hands on endless crab legs, prime rib, sushi, dessert bar, and dozens of other dishes. But eventually the let down afterwards is almost too great to bear. First of all, the price is outrageous. Sure $45 per person isn't terribly out of line when one considers the gourmet food that is offered. But that price is effective for EVERYBODY, even children. Children are considered anybody over four years old. If that isn't confiscatory pricing, I don't know what is. Even Disney charges kids' prices for those under ten. My seven year old son can eat a lot. But he certainly cannot eat $45 worth. He gets a couple of slices of pizza then heads straight to the ice cream machine. That's the most expensive pizza and ice cream this side of Chuck E. Cheese. As for myself, my aging stomach just doesn't expand like it once did a decade ago. Back in the day, I could pile plate after plate of protein on my table and finish every last delicious morsel. Now after two trips to the buffet, I'm pretty much done if I want to leave room for those enticing desserts. Lamb chops and Beef Wellington are great but one can only eat so much without getting severe reflux, or worse, nausea. I try to balance all the protein and fat with some vegetables, but cheap fiber fills me up quickly and I feel like I'm not getting my money's worth. Eventually all good things must come to an end and we manage to waddle ourselves out of the restaurant. That is when the real pain begins. With all the salt and cholesterol ingested, I've downed multiple glasses of free drinks to satisfy that powerful thirst. Then the fluid retention begins with a vengeance. My feet swell up so that my shoes feel a size too small. Ironically with the dry desert air, my lips are parched all the time. That means I drink even more fluids. Sleep comes fitfully that night as my thirst is unquenchable, my stomach is on the verge of returning its contents back to sender, and my legs feel leaden. Oh why did we think this was a good idea? As I wake up in the morning to prepare for the long tortuous drive back to L.A., I can barely tie my shoes over my bloated feet. Drinking all that volume will mean I'll have to make several bathroom stops along the way instead of just cruising nonstop like we did coming here. This is probably the worst excess that has ever been hoisted on an unsuspecting public. And I'll see you again next year when I come back for more R and R.
What's going on with all these stories about distracted anesthesiologists? Seems like some of us just can't seem to put down our smart phones and step away from social media for even a few minutes while we attend to our patients. First we had the Texas anesthesiologist who was fired for neglecting his patients while posting on Facebook, leading to one patient death in an otherwise routine procedure. Now the web has exploded with guffaws over a Seattle anesthesiologist who just lost his medical license for chronic sexting while in the operating room. 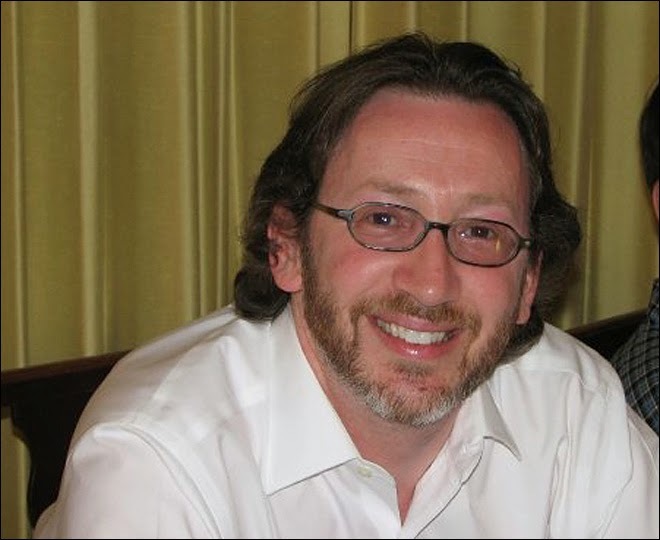 Arthur Zilberstein, M.D. had his medical license suspended for posting hundreds of sexts while working in the hospital. The Washington State Department of Health noted he had sent 250 text messages of a sexual nature between April and August of 2013. During one gastric operation, he posted 45 messages with "sexual innuendo" over an hour and a half. Texting like a teenage girl while at work is bad enough, but he was also found to have sexted pictures of his genitalia to his PATIENTS. Yikes. Other damning accusations include looking through hospital medical records for patient pictures to satisfy some sexual urge. To top it off, he had written 29 prescriptions for narcotics outside his medical practice without proper documentation. Dude, you seriously need to get some help. It maybe cute to sext people in high school and college, but man, it is time to grow up. A 47 year old man should have enough common sense and decency to know how wrong all this is. To all the anesthesiologists out there--please put that cell phone and iPad down while working. Don't think nobody will notice because EVERYBODY does. One minor anesthesia complication and everybody in the OR will accuse you of ignoring your patients while you were busy surfing the net. It just isn't worth it. I disappointed Mrs. Washington. I didn't mean to but I had no choice. Mrs. Washington was a sprightly woman in her seventies who could easily be mistaken for somebody two decades younger. She was coming in for a routine endoscopy. Though she had a myriad of medical issues common for somebody in her eighth decade of life, they didn't seem to affect her one bit. Mrs. Washington was one of those patients that was very easy to talk to. Some patients manifest their anxieties as anger or reticence. Not her. She made everybody feel at ease with her ready smile and outgoing demeanor. Patients have no idea what a huge difference this makes with hospital staff when they are able to put people around them relaxed and comfortable. It becomes a pleasure to work with the patient instead of a chore. As we wheeled her into the procedure room, she proudly talked about her life which revolved around her many grandchildren. Once inside, I placed my monitors on her and got ready to induce the anesthesia. I asked her to think about something pleasant she would like to dream about as she started falling asleep. As I slowly pushed the propofol into her IV, I recalled hearing Usher's "Scream" playing on the radio in the backgound. In no time Mrs. Washington was ready for her endoscopy. When she awoke after the procedure, the first thing she asked was "What happened to Usher?" The nurse and I looked bemusedly at each other. We asked her what she meant. She said she was having the most vivid dream of Usher. In her dream they were at a dance hall together and he was about to ask her to the dance floor. Her anticipation was sky high. As she reached out to him, ready to grab his inviting hand, she suddenly woke up. She said she wanted her Usher dream back. I reluctantly told her that her procedure was finished and it was time to wake up. She asked me if I could put her back to sleep for just a little while to finish her dream. I replied that unfortunately I can't put her back down again. Besides, even if I did there was no guarantee Usher will be there waiting for her. Though clearly disappointed she nevertheless continued on about her adoration of Usher. All the way back the recovery room she jabbered continuously about watching him on the TV show "The Voice" and how he seemed like such a nice young man. Yes, we agreed, Usher does appear to be a very nice person on TV. If the worst thing to happen that day was to disappoint a patient by breaking up her fantasy with Usher, then it won't be a bad day at all.